In December 2010, I was nearing the end of my first full year writing this blog. I was still trying to find my voice as a writer while attempting to find the right formula for each blog post. I hosted contests, wrote book reviews, and was lucky to conduct a few author interviews. One of those interviews was with Steve Light. I was immediately a huge fan of his work and have closely followed his blossoming career ever since. His latest book, Have You Seen My Dragon?, has been a huge success. It was a 2014 Parents' Choice Gold Award Winner for Picture Books, 2015 ALA Notable Book for Young Readers, and is currently a finalist in the 2015 Children's Choice Book Awards in the Children's Choice Illustrator category (Support Steve by voting here!). Steve Light's next book, Have You Seen My Monster?, will be available April 7, 2015! I have already pre-ordered my copy and can't wait to read it with my family! Last fall, I read Have You Seen My Dragon? to a few small groups of preschoolers and kindergartners at Family Reading Night at my son's school. 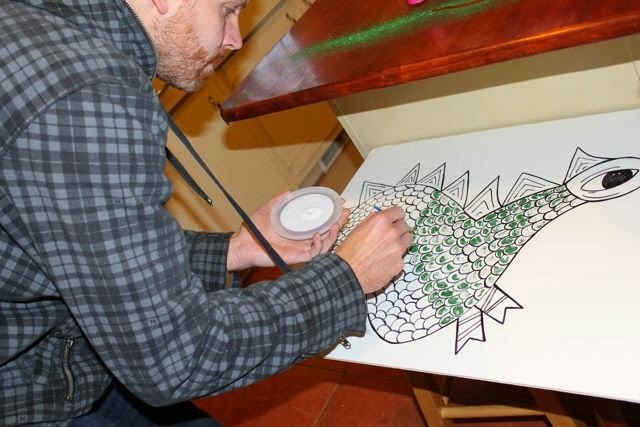 The theme for the evening was "Castles and Dragons" and I knew Have You Seen My Dragon? would be the perfect book to read. Plus, I had a surprise for them after I read the book that I knew they would enjoy! Have You Seen My Dragon? is about a boy who searches for his dragon throughout the city. He searches the bus stop, the park, and the rooftops of tall buildings to find his dragon. 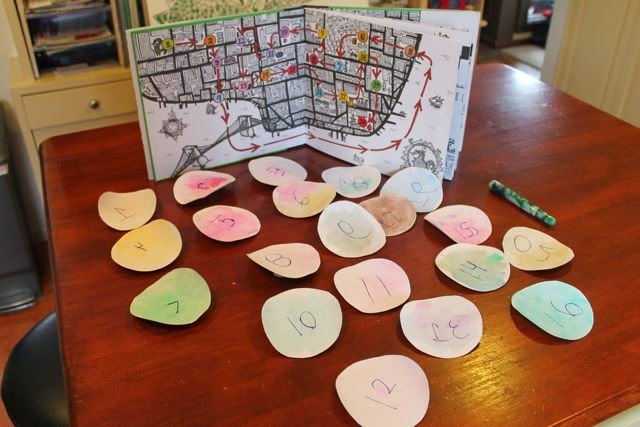 On each page, readers are provided an opportunity to show off their counting skills by counting the brightly colored objects; 3 buses at the bus stop, 6 monkeys in the park, 12 pigeons on the rooftop, and more. Also, on each page the dragon is hidden, but visible enough for young readers to enthusiastically shout out, "THERE HE IS!" 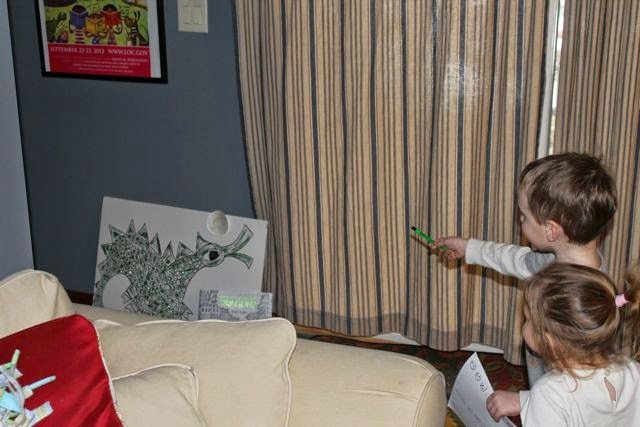 After boy searches everywhere and asks just about everyone he remembers exactly where he left his dragon. When I read Have You Seen My Dragon? to the small groups of children at Family Reading Night I noticed by the end of the book all of them were practically in my lap -- actually, one little guy climbed right into my lap! They wanted to see every last detail of Steve Light's elaborate pen-and-ink illustrations and count every brightly colored object. The book was a hit. But, I still had a surprise for them. I made a dragon, hid it in the gymnasium and it watched over us as we read the book. None of the children noticed him until I asked, "HAVE YOU SEEN MY DRAGON?" After they found the dragon I had them close their eyes so I could hide it again. Super fun! I drew the dragon with black Sharpie marker on foam core. Then I painted each scale with glue and added green glitter! 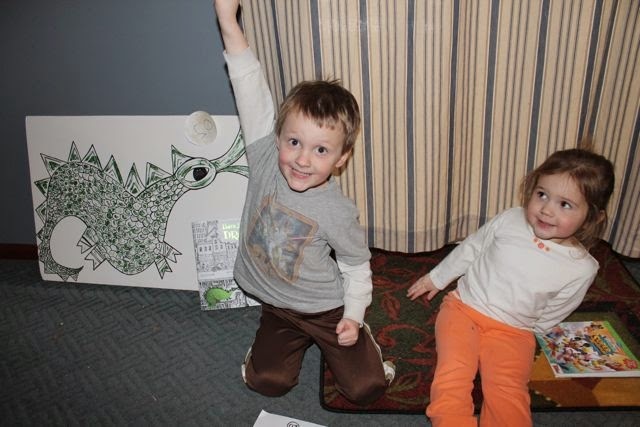 I wanted to use the dragon with my family to celebrate Steve Light's birthday, but we had already played hide-the-dragon at Family Reading Night. I thought about all the elements of Have You Seen My Dragon? that my family really liked. I realized one of their favorite things about the book is the end papers. The end papers are the pages that you see when you first open the book. One side is pasted to the cover and the other becomes the front side of the first page. In Have You Seen My Dragon? 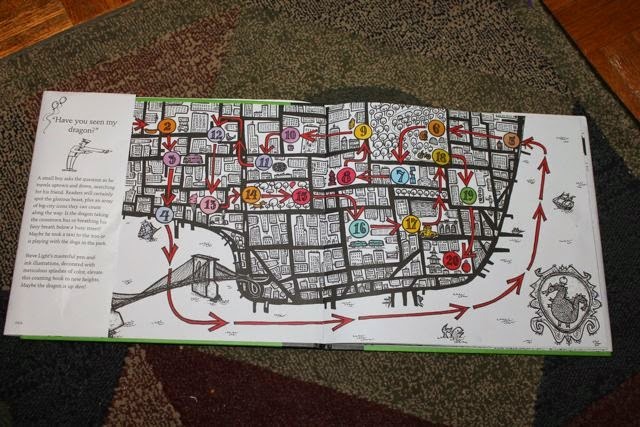 the end papers feature a map with colorful circles with numbers that show all the stops the boy makes throughout the city trying to locate his dragon. 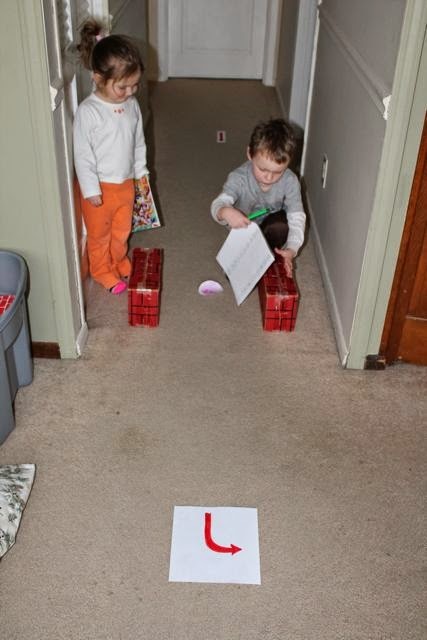 My children love following the red arrows to find the next number. This map gave me an idea for a birthday celebration activity for Steve Light. Every time we read Have You Seen My Dragon? 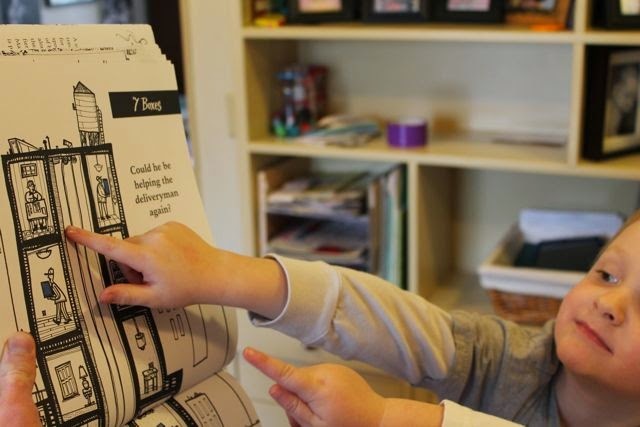 my children find Steve Light in his apartment with his fountain pens on the "7 Boxes" page. After reading, Have You Seen My Dragon? 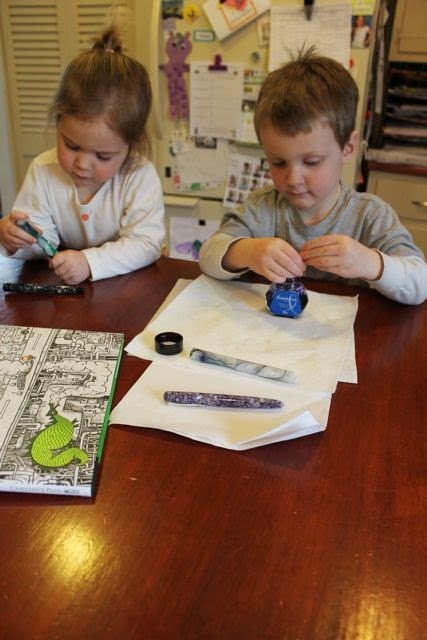 we filled our fountain pens with ink. 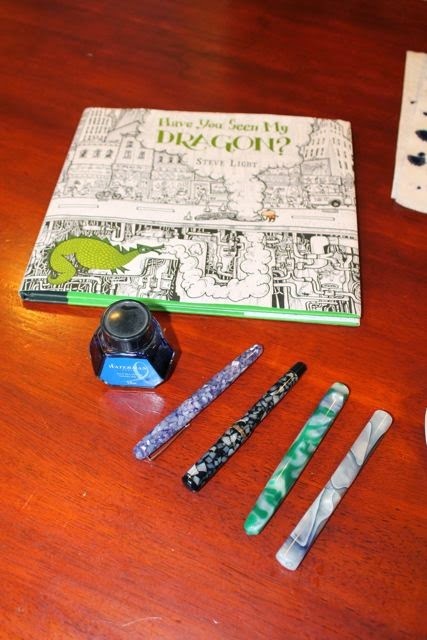 We used these fountain pens to celebrate Steve Light's birthday in 2013. 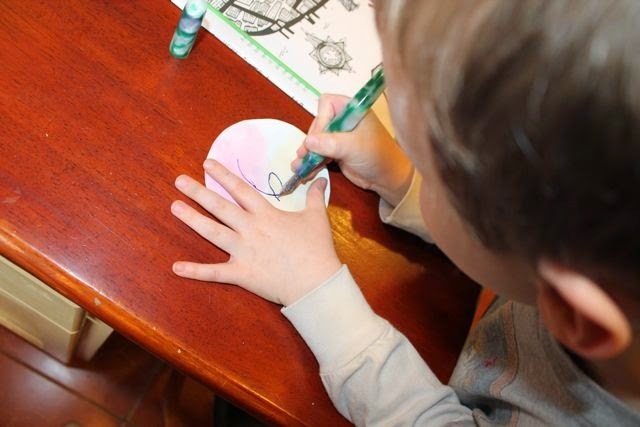 My son tested out his pen. 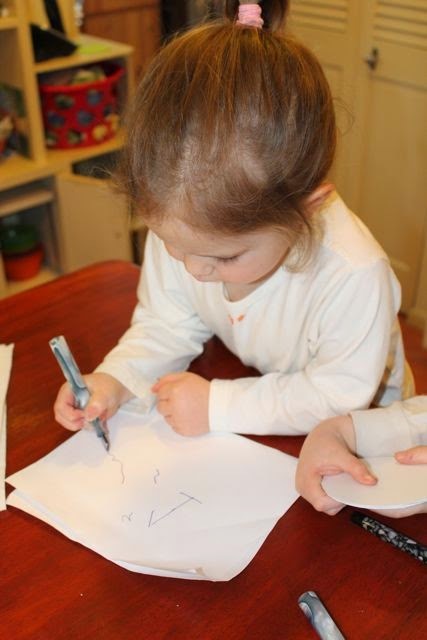 This was my daughter's first time using a fountain pen. 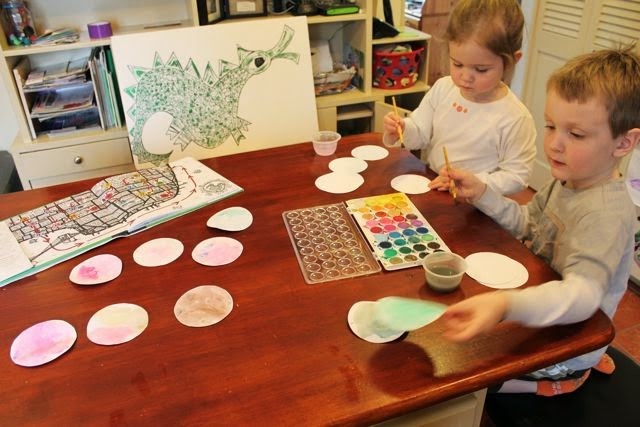 My children painted 20 card stock circles with watercolors. The dragon watched on as they worked. 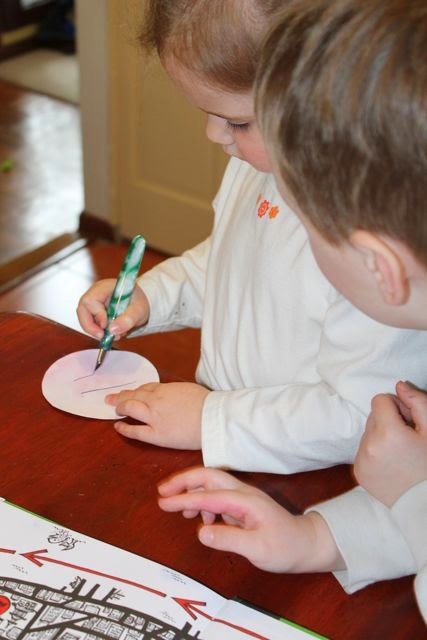 My son used his special fountain pen to write a number (1-20) on each circle. 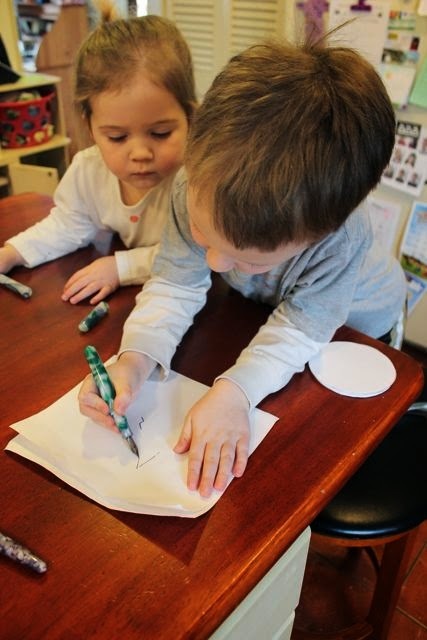 He was great big brother and let his sister write the number 11. I love this picture. Lil' sis learning from her older brother. They finished all the number circles. 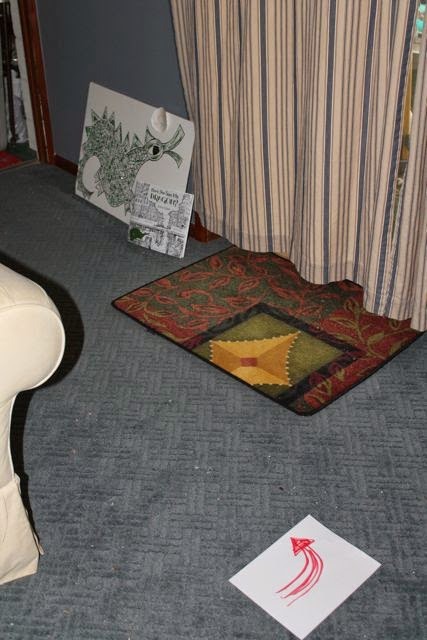 Then, I told them to go to a bedroom while I hid the circles all over the house. My son asked for a list of the numbers so he could check them off as they found each one. 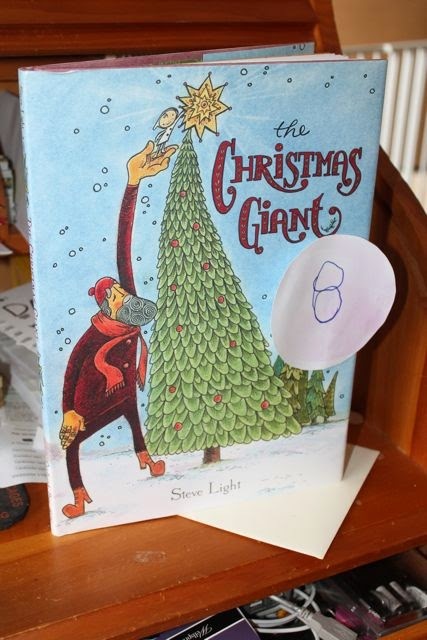 Number 8 was on The Christmas Giant which was the topic of the interview I had with Steve Light back in 2010. I hid all the numbers, in order, along a path of red arrows. 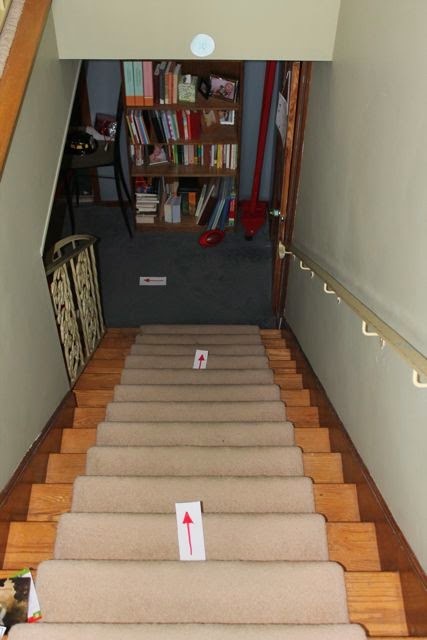 The path led them into the basement. 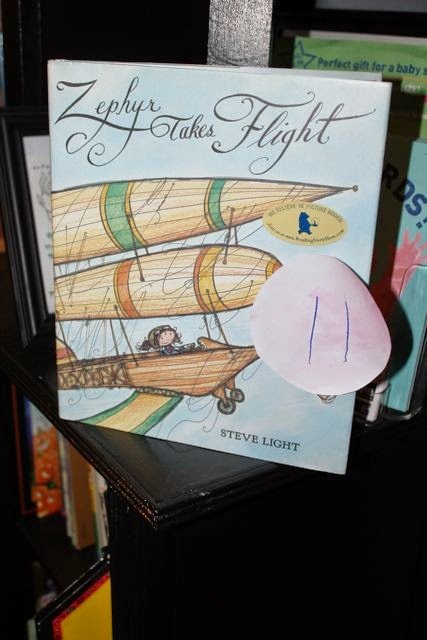 Number 11 was on Zephyr Takes Flight which was highlighted in our birthday celebration for Steve Light in 2013. 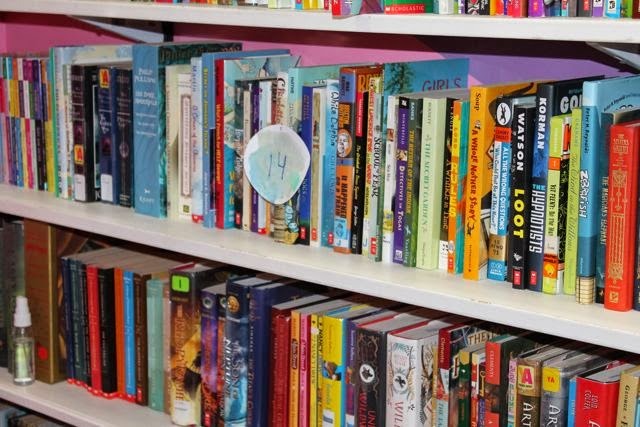 Number 14 was on one of our many bookshelves! The last red arrow pointed the way to number 20 and the dragon! They loved the number hunt and were so happy they found each one! 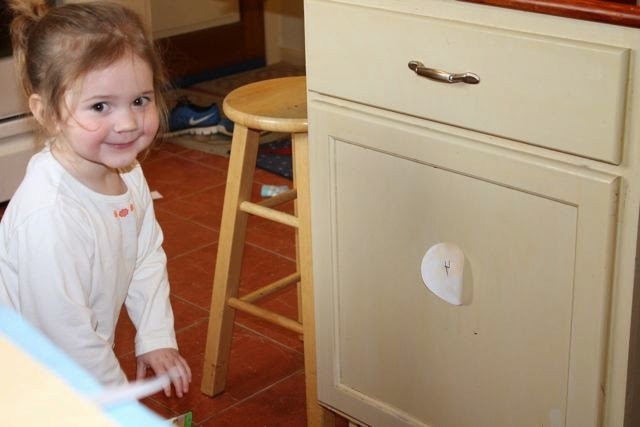 We have played "Have You Seen My Dragon? Number Hunt" many times. My son loves to hide the numbers, but chooses not to use the red arrows. 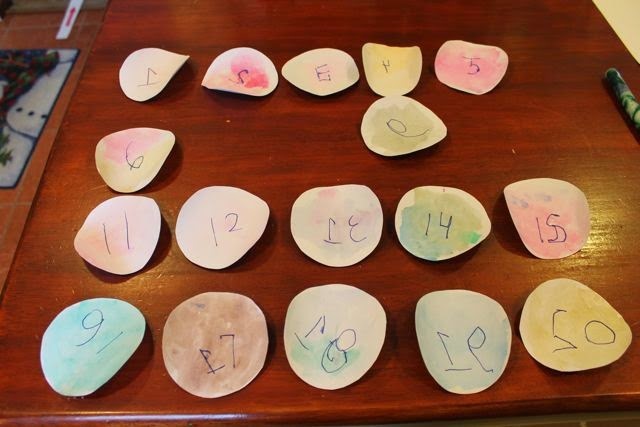 It has led us to renaming this activity, "Have You Seen My Numbers?"! We usually are missing at least 3 after each round! Steve, "Happy Birthday" and congratulations on all your recent successes! I am so thankful that I was introduced to you in 2010. Your artwork and creativity are an inspiration! Thank you for making such wonderful picture books!